Demo Refresh: If you have tried Corona Renderer before and your 45-day trial expired, you will be glad to know we have automatically refreshed the demo period to give everyone an extra 14 days! Simply download and install 1.7 from the link above, and you can activate the refreshed demo period right from within Max, so you can try out all the new features for yourself! Enjoy! As most of you already know, on August 25th 2017 we announced the merger with Chaos Group, the makers of V-Ray. Corona Renderer 1.7 brings the first fruits of the union with new technology integrated into Corona Renderer from V-Ray. You can learn more on our announcement blog post. The next sessions for Corona Academy are set for November 11th to 12 and December 2nd to 3rd in Prague. These will be the first Corona Academy sessions based on Corona Renderer 1.7 – both sessions are almost fully booked, so be sure to sign up fast! Development is forging ahead, with Interactive Rendering now in the daily builds. Keep up with the development schedule on the Corona Renderer for Cinema 4D roadmap, and download the latest daily builds to try it for yourself! We also had a great time as one of the sponsors at the recent Half Rez 6 event in Chicago! We’ve also been updating our Helpdesk articles, and will continue to add to these as well as our video tutorials. 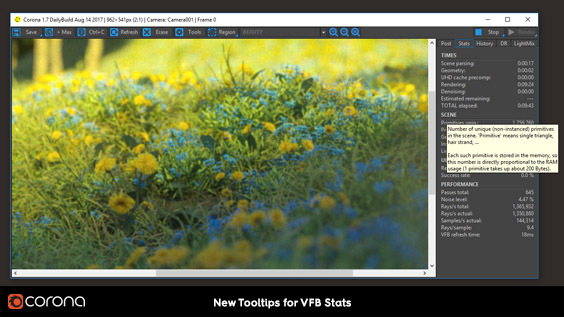 This optional new algorithm can speed up your renders by up to 6 times by learning which scene lights are important at a particular location. Those lights then receive more rays than the others, resulting in a lower noise level. The new algorithm can give benefits whenever there are at least two lights in the scene, and it has no parameters that you need to set. The biggest benefits will be seen when there are many lights, or where the lights have complex emission profiles, or in scenes with high occlusion (where a lot of the lighting is blocked by obstacles). For compatibility with older scenes and to ensure trouble-free rendering in new scenes, this is disabled by default. You can enable the new algorithm under the Performance Settings section of the Render Setup, or leave it disabled if you experience any issues with the new algorithm in particular scenes – in particular, it may have problems with certain non-physical fakes and transparent lights, and this will be updated in the next release. 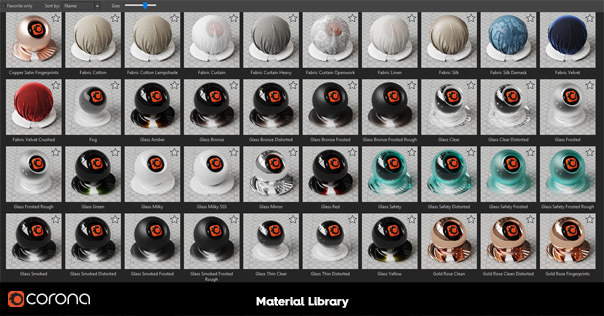 This is just the first iteration of the Material Library, and functionality and features will be expanded in the future, for example to allow you to add your own materials – keep an eye on the roadmap where we will be announcing the future plans for it! 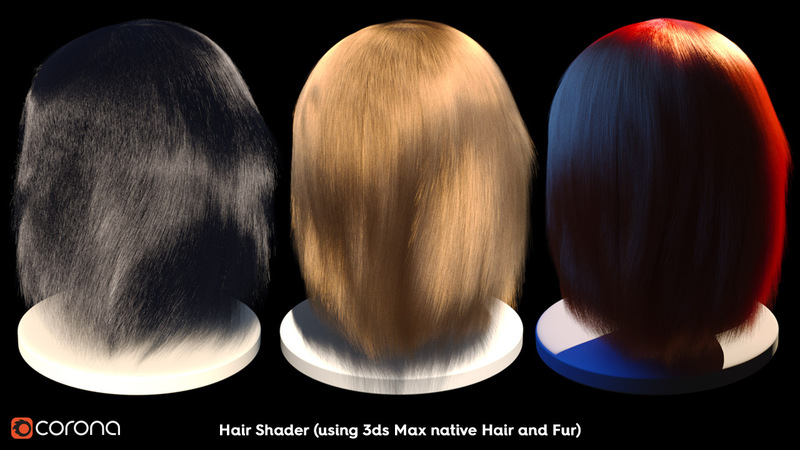 Support has been added for all major hair and fur rendering tools – 3ds Max native Hair and Fur, Ornatrix, and Hair Farm. The above image uses CoronaHair and CoronaSkin, plus Dispersion for the jewelry – hair created using Hair Farm. Hair has particular unique qualities that need a dedicated shader. 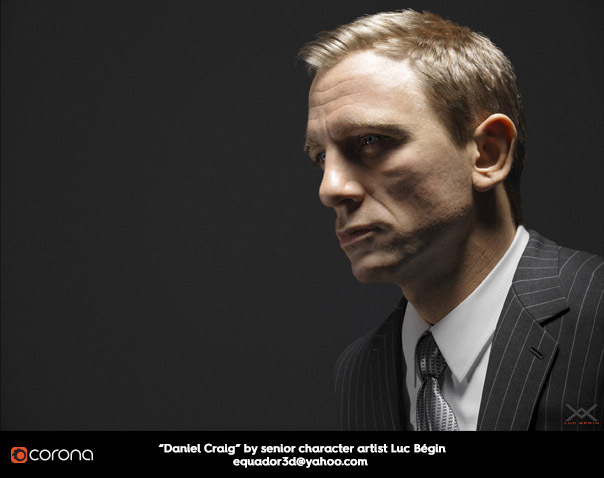 The CoronaHairMtl shader is physically accurate, and handles the unique highlights and transmission properties that hair requires, while still rendering quickly and giving you the ease of use in controlling the material that you expect from Corona Renderer. 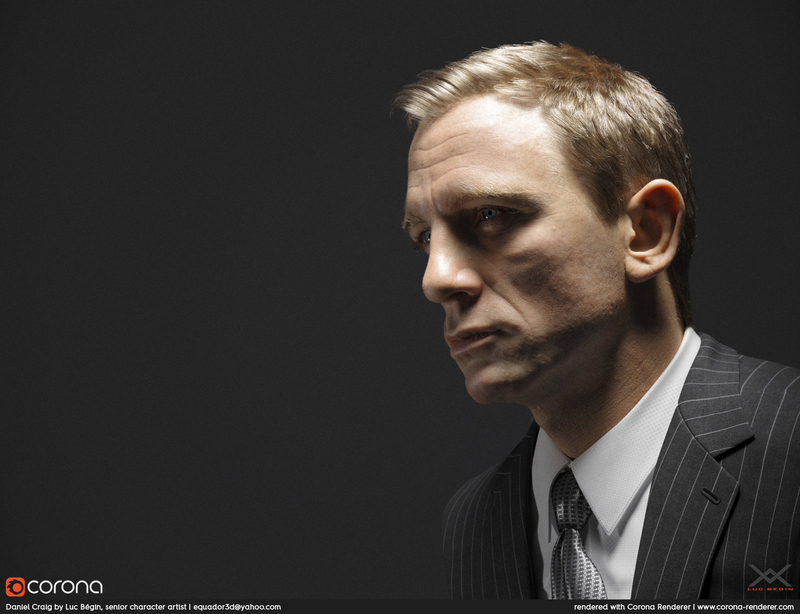 Skin is one of the most complex materials to render, with many properties unique to skin that cannot be covered in an all-purpose shader. 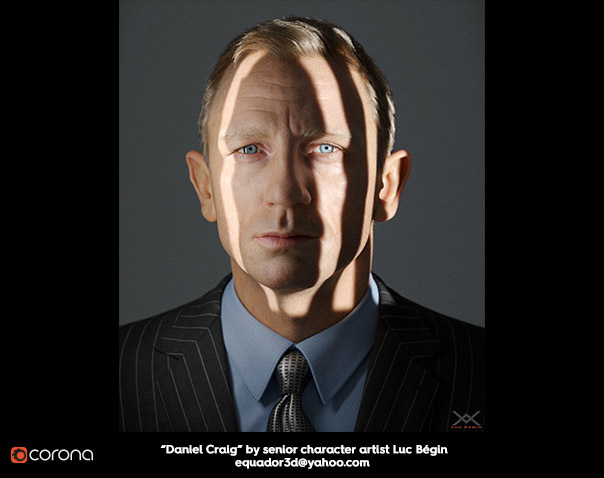 The new CoronaSkinMtl shader makes it easy to control and adjust the look of the skin, and renders fast and efficiently with realistic results. 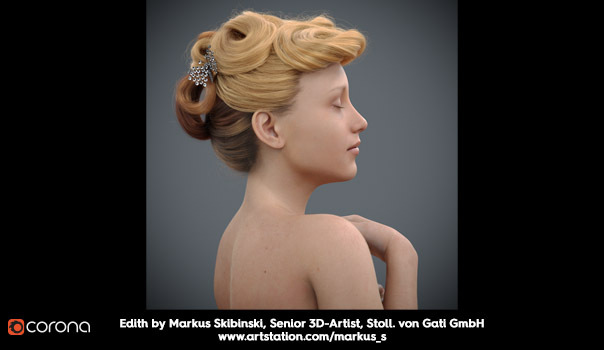 Even if you have never tried rendering realistic skin before, you’ll find it easy to use and will get great results with the default settings. The new SSS Mode in the CoronaMtl is ideal for creating solid materials with SSS effects, such as marble, wax, food and others with easier control and more realistic results than before. 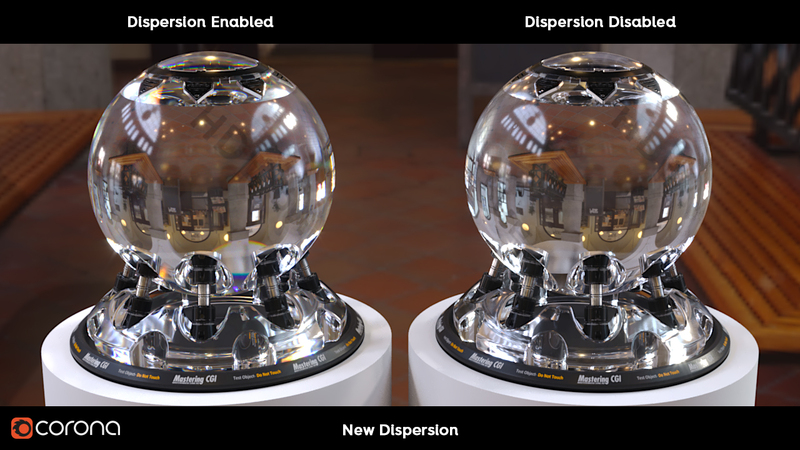 Now you do not need to use Opacity, Refraction or Translucency and can control the effect purely from the Subsurface Scattering Amount, Radius and Scatter Color. 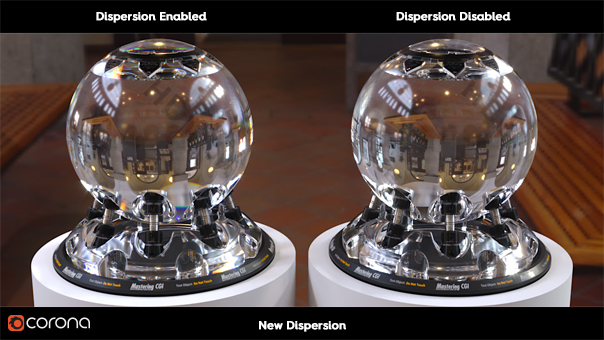 The previous Volumetric mode has been retained for creating liquids, glass, clouds, fog and similar materials that include translucency or refraction, and for backwards compatibility with existing materials. 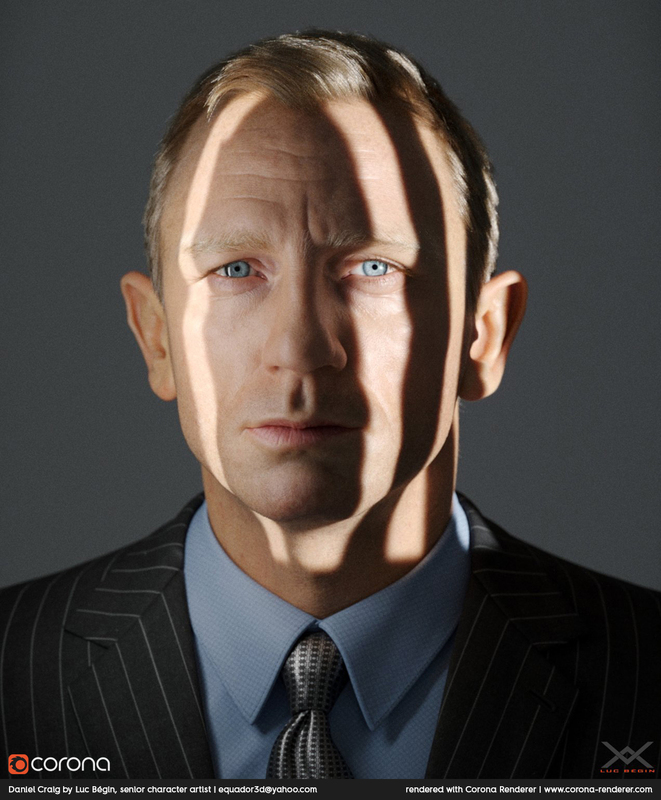 Some refractive materials bend light by a different amount depending on the wavelength of the light. This is called dispersion and creates a rainbow effect in the refracted light. Dispersion can be enabled in the standard Corona Material, and is controlled by the single Abbe number parameter. Enabling it adds realism to gemstones, glass, liquids and other materials. Rather than apply a modifier to a native 3ds Max camera, you can now use the dedicated CoronaCam! You add this object to your scene right from the Command Panel > Cameras > Standard. It features all the controls you get from a native 3ds Max Physical Camera, plus all the Corona post-processing options, panorama / VR options, and more, making it easy to save unique settings of these parameters for different cameras. 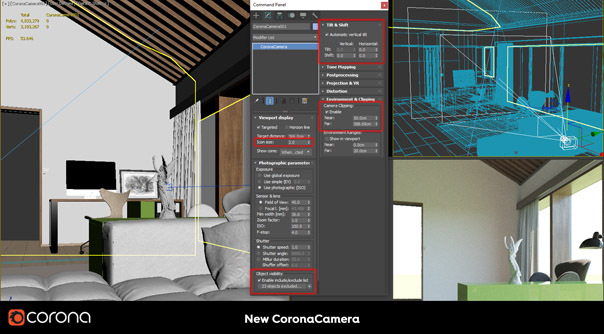 The CoronaCam has the ability to include or exclude objects in the render from that specific camera. It also has an improved UI in the viewport, resize the icon for the camera, see the clipping planes in the viewport, etc. Also, it won’t restart IR when you change the tone mapping parameters. By default, 3ds Max treats bump maps differently, so that some maps do not work as inputs to bump mapping. The Corona Bump Converter resolves this, allowing you to use any map as an input to the bump map channel in a shader. The Corona UVW Randomizer map allows applying random offset / rotation / scale to textures and maps applied to different objects. For example, you can randomize a wood texture applied to a set of planks so that each has a different look in your final render. A new CoronaRoundEdges map algorithm has been introduced as a Fast option, as it is much faster compared to the old RoundEdges map and produces no noise. The old algorithm is available as the Precise mode, and scenes created before 1.7 will load with this option used to maintain compatibility. Old habits die hard! A long time ago, back to when Corona Renderer 1.0 was released, we started with a naming convention 1.1, 1.2 and so on. However, each version was in fact a major upgrade with significant improvements to both speed and functionality, while the naming convention we’d adopted did not really convey that. 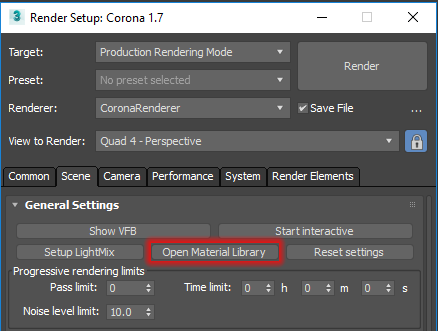 We decided that it was a good time to pause and rethink, and as a result “the software previously known as Corona Renderer 1.8” will now be named Corona Renderer 2, the next release after that Corona Renderer 3, and so on. There’s no change to how we work or what goes in to each version, just a change in how we name it so that it is easier to understand and more accurately reflects the new features and improvements that go in to each version. 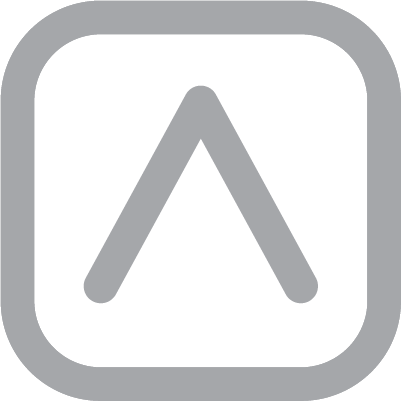 As always after a release, we will be starting work right away on the next version. Detailed plans for Corona Renderer 2 and preliminary plans for 3 are already laid out and work has begun! Version 2 will be more focused on optimizations, tweaks, debugging, and quality of life improvements, to solidify all the major changes made in the last few versions. Did you get carried away reading, and forgot to start your download? If so, here’s that download link again, to save your scroll wheel from unnecessary wear!